Laurel BMW plans to make the Pinewood Derby an annual event. Laurel BMW of Westmont (Ill.) was asked to donate money for a new Pinewood Derby track. Instead, the dealership bought the whole track and hosted the event in its showroom. At 13, Patrick Womack rode his bike to the nearby Porsche dealer on a Sunday and dreamed through the darkened windows about the high-performance machines inside. Womack is 50 now and works on the other side of the glass -- running a BMW dealership in Westmont, Ill. Yet the boy who once dreamed of fast cars is now doing what he can to fan that passion in a new generation. Early this month, Laurel BMW of Westmont took a dozen cars out of its large showroom to make room for a huge aluminum track and hundreds of shouting, clapping, enthusiastic Boy Scouts and parents. 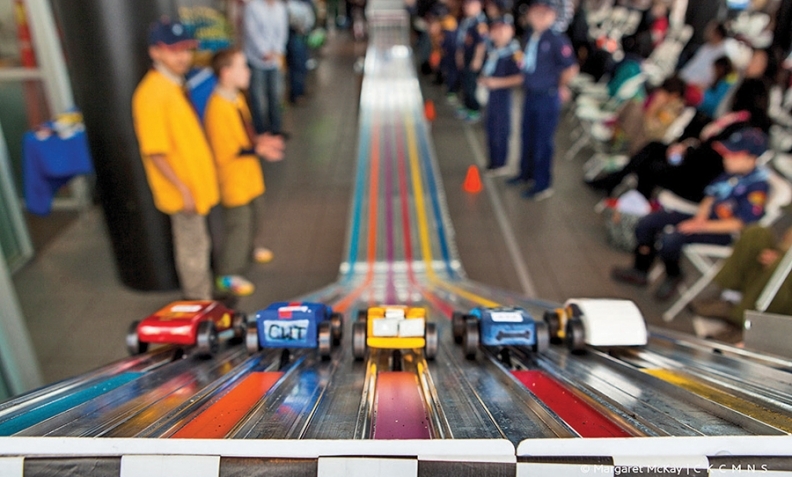 On March 1, the suburban Chicago dealership sponsored and hosted the Pinewood Derby for about 60 local Boy Scouts of Pack 10 to race model cars. The daylong event was paid for entirely by the dealership and included BMW hats, stickers and other gifts for each Scout participant, as well as food and appearances by celebrity racing guests. All in, the day cost the dealership -- owned by AutoNation -- almost $10,000, including nearly $3,000 to purchase an official Pinewood Derby track. Yet the cost was secondary to spending a day getting kids interested in autos and racing, Womack said. "My goal is to make an impression on these younger kids and to get their heads out of the phones and the iPads and whatever. I really think that we need to do more to get the interest of these kids into cars and racing," said Womack, Laurel BMW general manager. Staff from the dealership volunteered to help at the event, though much of the official work was done by the Scouts. The dealership, which sells about 1,250 new and 1,100 used vehicles a year, didn't do any business, but staffers did build relationships with scouting families. Laurel BMW got involved in the Pinewood Derby only about four months ago when a longtime customer asked Womack whether the dealership would like to donate to help Pack 10 raise money for a new track. A former Scout himself, Womack replied that not only would the dealership donate; it would buy the track itself and host the event. Womack, who races cars -- full-sized ones -- as a hobby a half-dozen times a year, remembers growing up with a famous racer, Parnelli Jones, living nearby in Southern California. On certain Fridays, Jones would pass out stickers for STP, a fuel additive and his sponsor, to kids who stopped by his shop in Torrance, something Womack did often. "I'm 50 years old, and I don't remember a lot from third grade, but I remember on Fridays I'd be excited to stop by and get my STP sticker. And Parnelli Jones himself would stand outside and hand these out to the kids," Womack said. "Obviously, it left a lasting impression on me." The store coordinated the event, Womack said, including arranging the purchase of an official Pinewood Derby race track, which now sports the dealership's logo. The track features an electronic timing mechanism that automatically records the performance of each wooden racer. Womack said he looks at the cost of hosting the Pinewood Derby, which he plans to make an annual event, as an investment, both in the dealership and the community. "It allows some local parents to come into the dealership and maybe meet some of my people, but that's not why we're doing this," he said. "You're giving back to the community as I think you should do. And I'm piquing the interest into a business and a sport that I'm passionate about."